Space Gulf has has more than 10 years of experience in design and manufacture of tower structures of various types for telecom/wireless applications. Our in house teams of highly qualified designers use state of the art structural design software to provide optimal solutions to customers for their antenna mounting structure requirements. We have successfully designed, manufactured and supplied towers from 9 m to 100 m for telecom applications. SPACE GULF we manufacture and supply galvanized towers of tubular and Angular designs for an array of customers in Telecommunication. 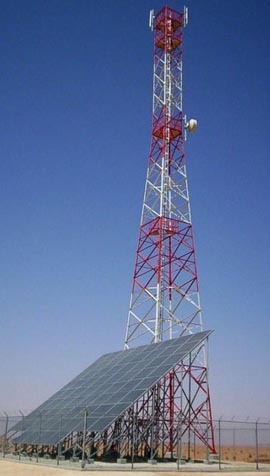 We provide both Ground Based towers (GBT) and Roof Top towers (RTT). At Aster all tower parts go through multi-purpose CNC machines that are programmed to perform punching, stamping, drilling and cutting. Hydraulic presses, matching tools, jigs and fixtures ensure that bent items are handled without distortion. At Space Gulf we have standardized the processes of cleaning, degreasing, pickling, fluxing heat treating, and galvanizing steel faster than any current technology employed in the industry for an ideal reaction between steel and Zinc. The pre-heating chamber ensures uniform drying & preheating of steel to give it an excellent surface finish and uniform coating of zinc. The temperature of Galvanizing Furnace is accurately controlled by microprocessors.